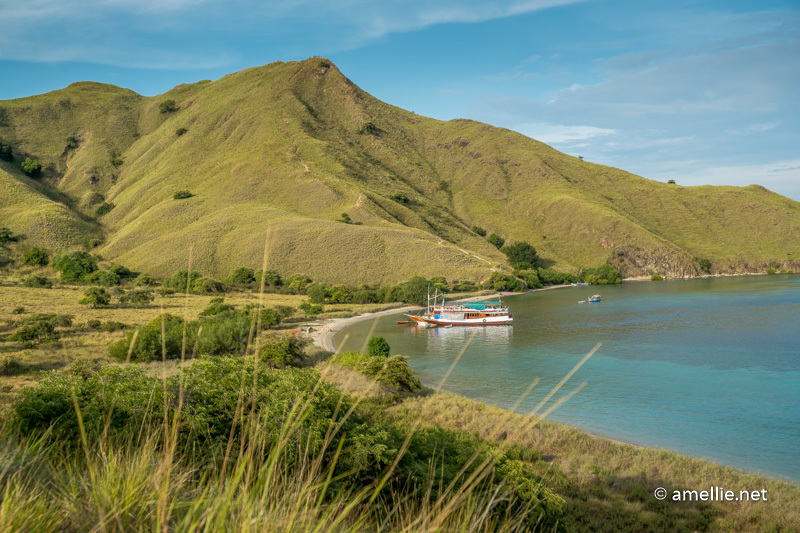 Sailing around the islands of the Komodo National Park is one of the must-do activities when you are in Flores. 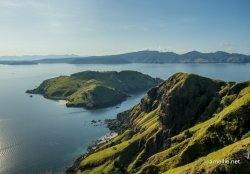 The National Park stretches a total area of 1,733 km2, which includes the three famous islands: Komodo, Padar, and Rinca, as well as 26 smaller and lesser-known islands. The three main islands are huge in size and although they look quite close to each other on the map, they are not exactly near. The sailing trip is a perfect choice for travellers who want to see what these islands can offer. 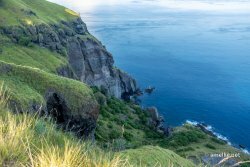 The sailing trip involves hopping on and off these islands within a day or several days. For this trip, I decided to take a 3-day 2-night sailing trip. It is possible to take a day or a 2-day option, but I love to enjoy my time on the boat, relaxing and covering a few islands without being in a rush. The sailing trip should be a relaxing experience, shouldn’t it? Taking the 3D2N sailing trip is perfect for my requirement. 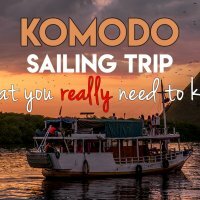 In this post, I am sharing with you the usual 3-day-2-night Komodo sailing trip itinerary and some tips and what to expect from taking this sailing trip. Don’t forget to watch our vlogs as well on our Komodo trip. 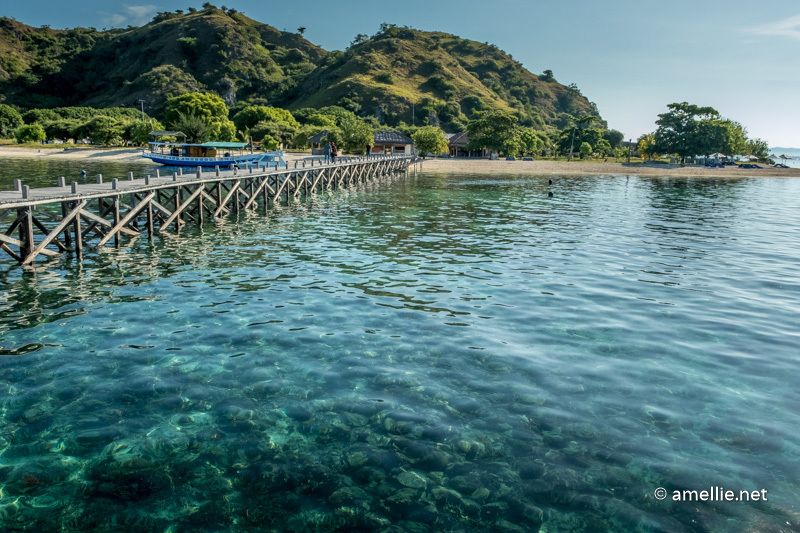 The sailing trip starts at 9 AM in the morning from Labuan Bajo, a small port town off the coast of Flores Sea. The departure time can be much earlier in the morning, depending on how many days you are taking the sailing trip for. 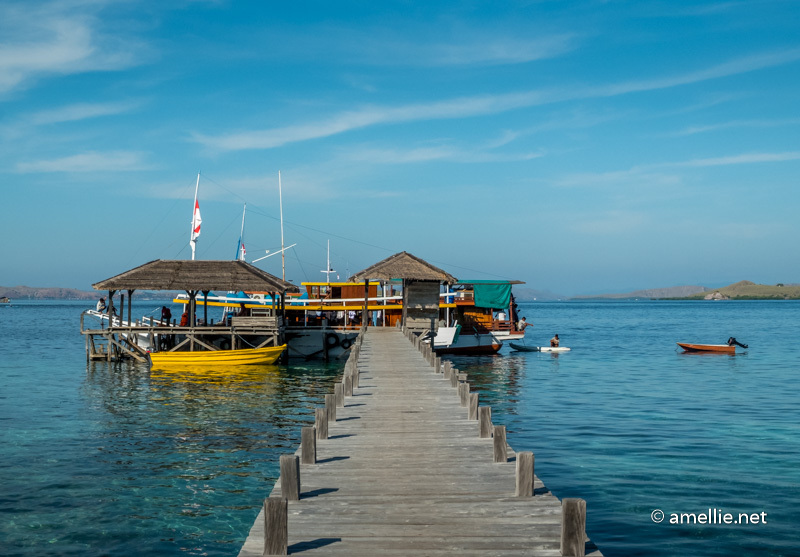 I would suggest arriving a day before in Labuan Bajo, as I have some experiences of delays with some Indonesian airlines and you surely do not want to risk delaying or missing the sailing trip. We were picked up at our hostel, Green Hill Bed Station at 8.30 AM. The pick-up and drop-off services are included in our sailing trip package. They can either pick you up at your accommodation or the airport, which is located only a few minutes away from the jetty. Labuan Bajo is a very small town! We were very lucky to have the boat to ourselves. The boat can fit up to 5 guests, but there was only my husband Foogie, our friend Ikmal, and I along with mas Indra, the owner of the Be Borneo Tour, which runs this sailing trip (contact details below). The boat is manned by a captain, a helper, a cook named Yohannes, and also our tour guide, Jo. All of them have been extremely pleasant and fun to be with during our sailing trip. 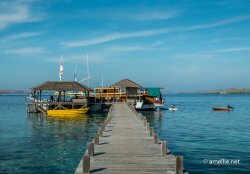 Kelor Island is the first stop, as it is located around 30 minutes away (with a small boat) from Labuan Bajo. 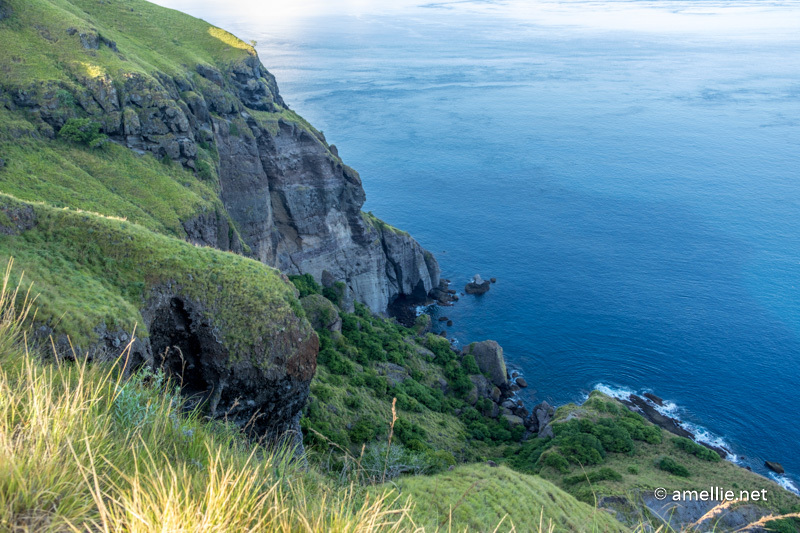 We hiked for 10-15 minutes to the top of the island to see the beautiful view of the surrounding islands. It was a good warm-up for me before doing walking and hiking activities for the next two days. After the hike down, we found a coconut seller and we immediately bought two coconuts for Rp. 15,000 each. Such a refreshing drink for a super hot weather! 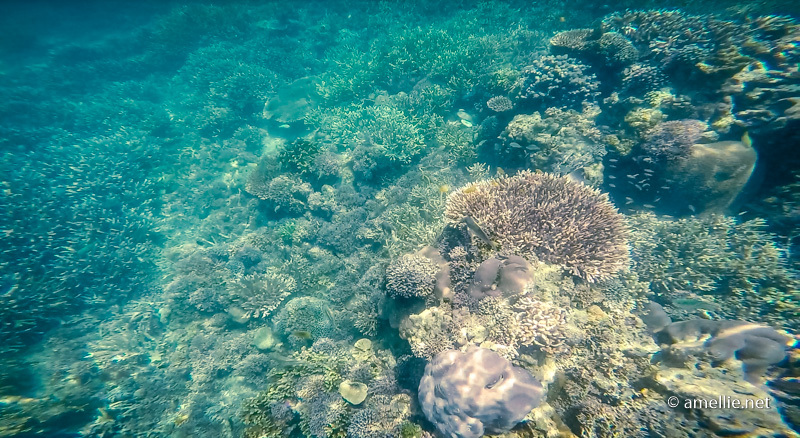 We stopped by in Menjarite Island for snorkelling. The island is located 20 minutes away from the Kelor Island. 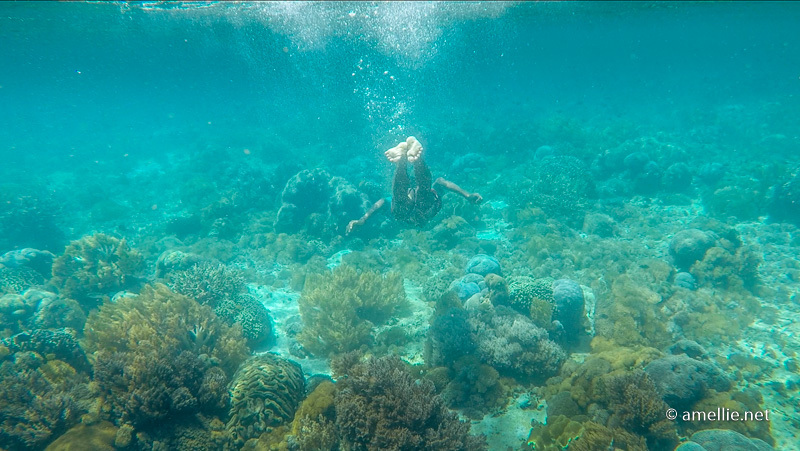 The coral reefs here were not that spectacular, compared to the Pink Beach or even Ora Beach and Pulau Tujuh in Maluku. 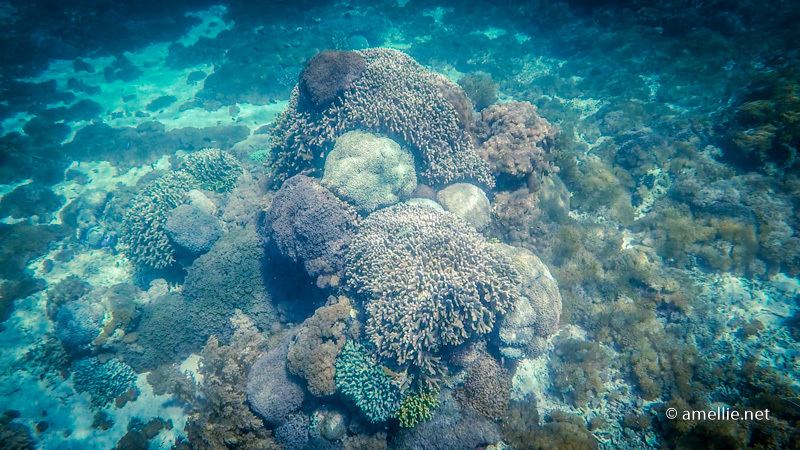 A lot of the corals here are unfortunately quite dead. 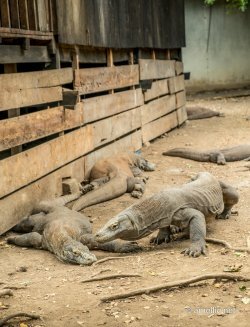 There are at least two islands where komodo dragons can be found, Rinca and Komodo islands. I’ve done a bit of research before starting this trip and I talked to some travellers too who have been to both islands, and most of them told me the same thing: Rinca Island is much more interesting than the Komodo Island. 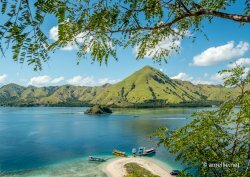 So, I would prefer to go Rinca Island and spend a long time on another island than visiting both Rinca and Komodo. 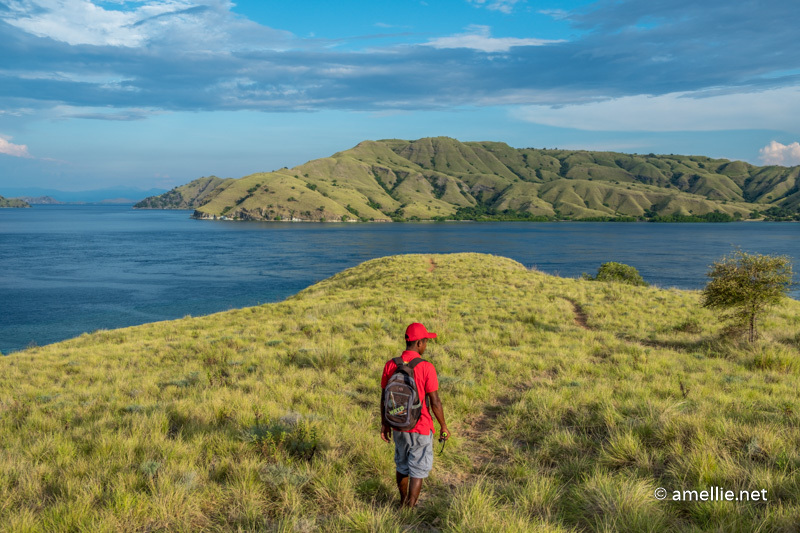 As soon as you enter the Rinca Island, you will be greeted by a ranger who will guide your way around Rinca and answer your burning questions on these gigantic animals, the komodo dragons. We caught our first glimpse of a baby komodo, trying to hunt some monkeys on our way to the ranger’s complex. Unfortunately, the komodo was outnumbered by those monkeys. 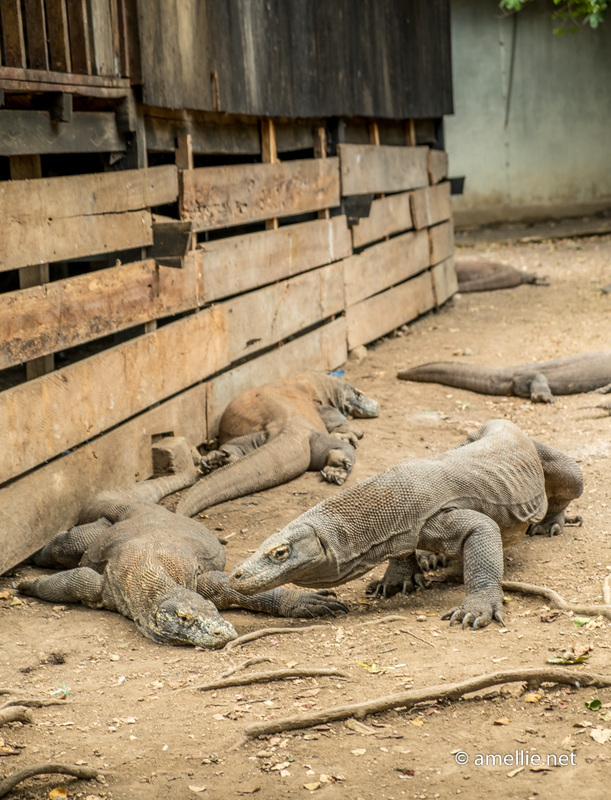 But it looked like the komodo was not scared of them and kept advancing despite the confrontations from the monkeys. An interesting sight! We also saw some komodo dragons near the ranger kitchen. The ranger told me that these komodos gathered here due to the smell of foods. They were quite used to seeing humans, so they wouldn’t do anything as long as you keep a safe distance. Our journey continued discovering some of the nests that the komodo dragons built in order to protect their eggs and hiked to the top of the island to see the 360 degrees view of the Rinca Island. It is no doubt a beautiful island with vast savanna as far as your eyes can see. The entrance ticket is included in the package of this sailing trip. 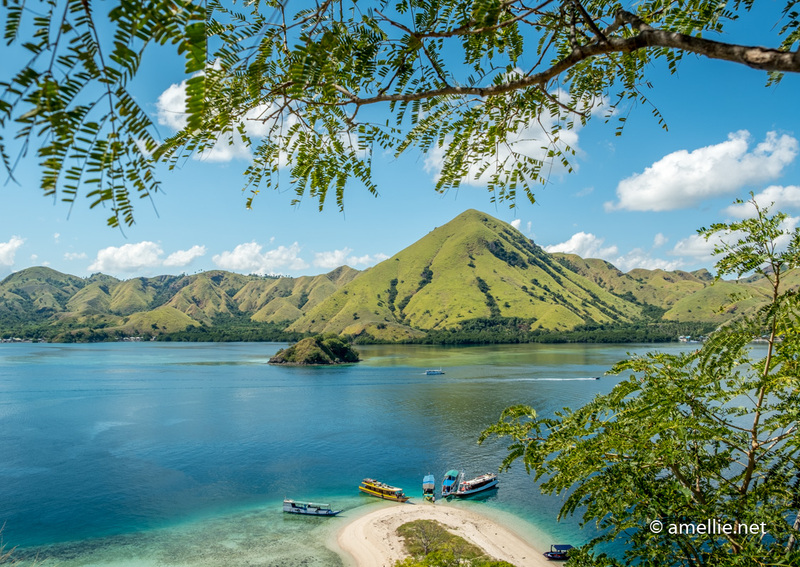 The total cost of entering the Komodo National Park is Rp. 250,000 per person for a foreigner. Do note that you are not allowed to swim around Rinca Island as there were some sightings of sea crocodiles. As the sun was setting, we stopped nearby Kalong Island to see many bats flying from Kalong Island to other nearby islands. There were hundreds of them, migrating to at least two different directions. These bats make the same move before dark to a forest in other islands in search of foods. They would come back to their original habitat before sunrise. The journey from the Kalong Island was a spectacular scene. What more can I ask for? After having dinner, we had a very interesting conversation with our guide, Jo and also mas Indra. I brought some card games, but we ended up not playing them as we were busy talking or chilling during our time on the boat. I am surprised at how calm the sea was in the evening! 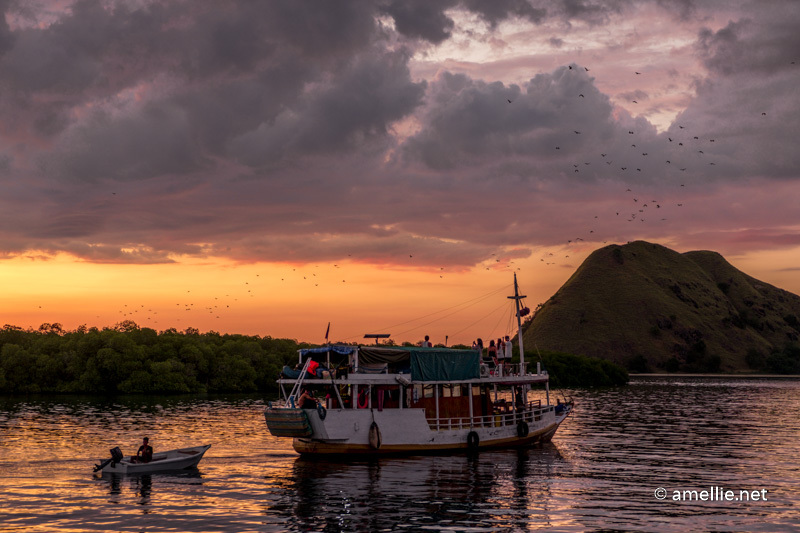 The boat started to make the move before sunrise to Padar Island, the highlight of our sailing trip. Komodo/Flores becomes a hit destination thanks to Padar Island, where a majority of the pictures of the Komodo National Park shared on Instagram are taken here. In order to see such an epic view though, you would need to hike for at least 15-30 minutes. It was not a difficult hike per se, as wooden stairs have been built on the first half of the trail. The striking sunlight is what makes the hiking experience quite tiring. Make sure to bring enough water before you start the hike. We are lucky to have our guide, Jo, who always remembers to bring water for us! 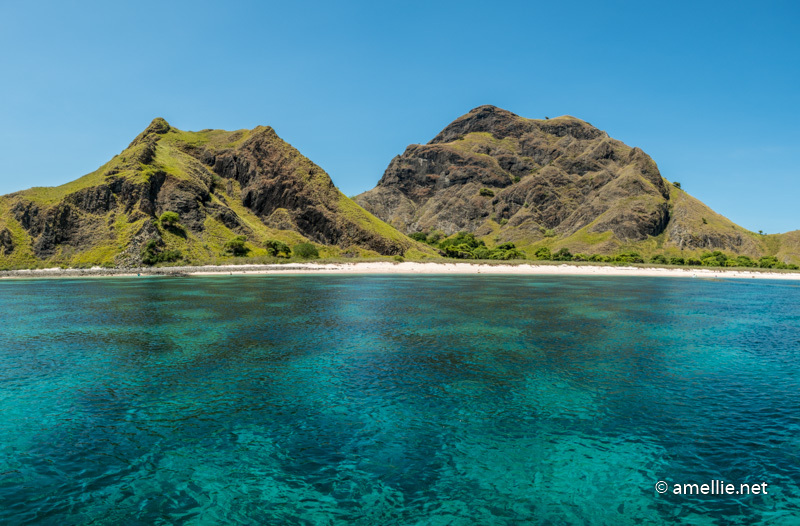 I was not very pleased with the number of crowds occupying some “hot spots” of Padar Island. So I continued further up until I saw fewer people. The view was AMAZING though! I can’t describe how beautiful this place is! 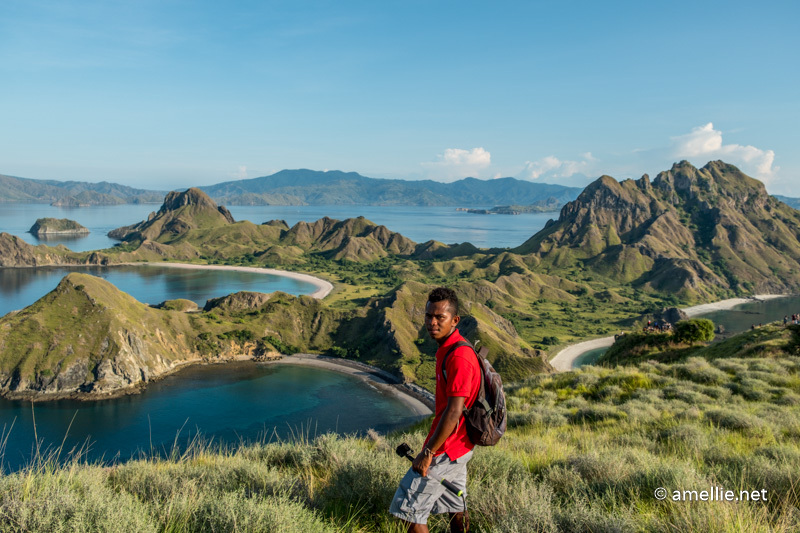 Oh by the way, if you keep hiking all the way to the end, you will see these views at the other end of Padar. Pink Beach is one of the most beautiful beaches here in the Komodo National Park. 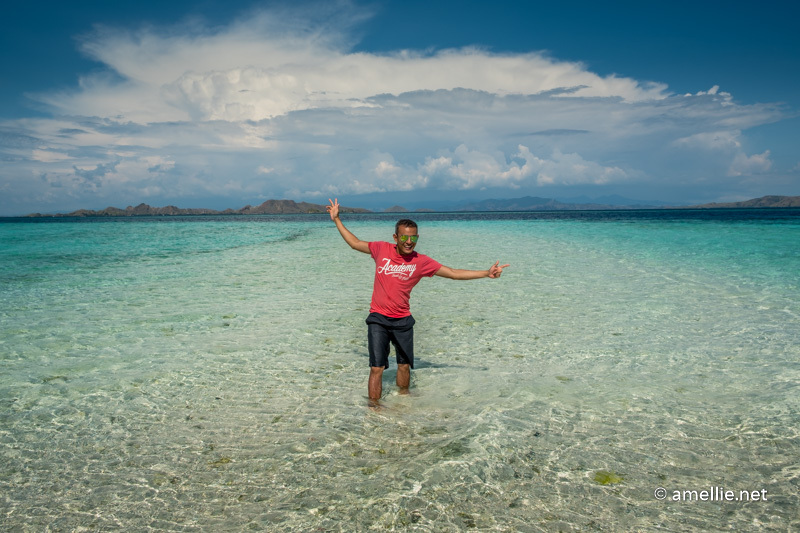 Due to the very strong current, we didn’t go to the original Pink Beach in the Komodo Island (it can take 3-4 hours to get there because of the current!). 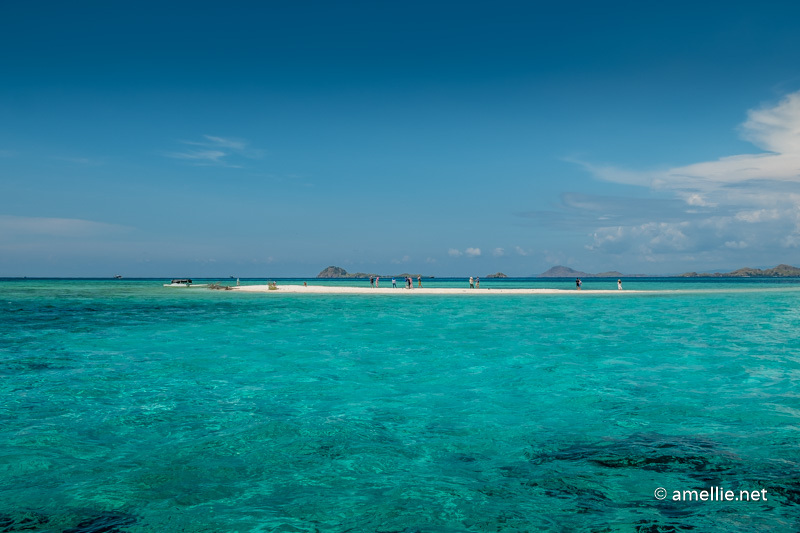 We went to another one, which is closer to the Padar Island. I did not mind the change of plan because there were way fewer people here! 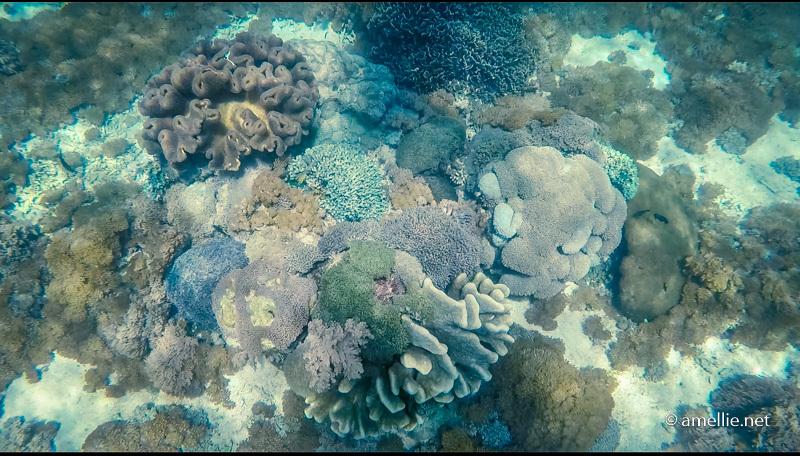 The corals are also very pristine, colourful, and beautiful with lots of fish. According to our guide, the original Pink Beach is less “pink” compared to this island. So I guess, we went to the best one, yeah? 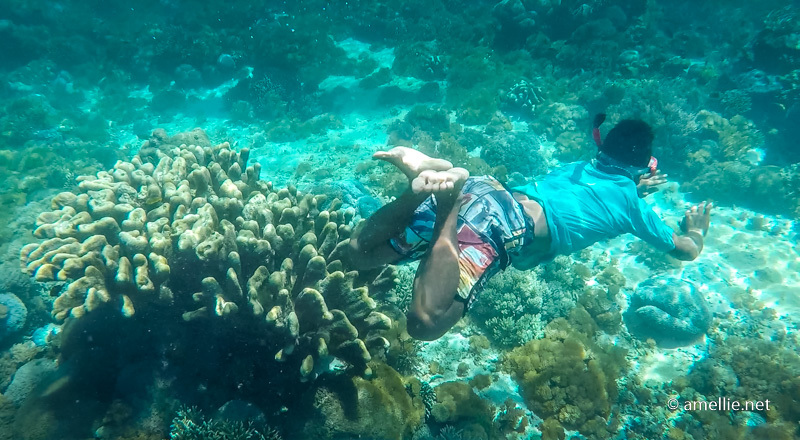 Make sure you start to snorkel in the direction of the current so that you don’t have to swim much. Fighting against the current would be quite tiring. The beach is really pink in colour, due to the pieces of dead red corals. It’s beautiful! One of the best beaches I have been to! 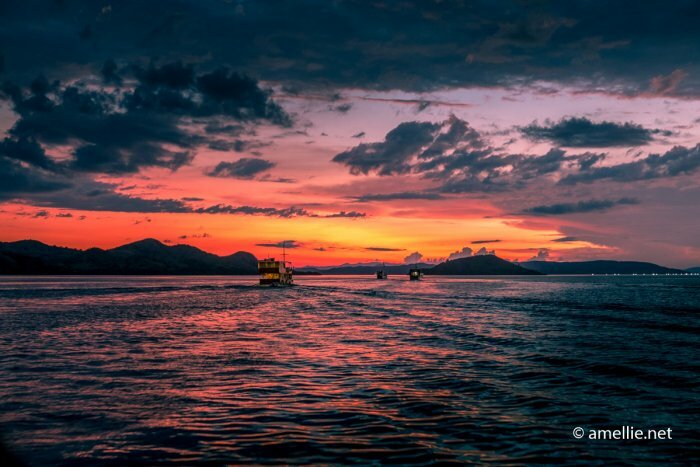 Gili Lawa, literally translates to the “Beautiful Island”, is a popular stop to see the sunset. The hike takes at least 30 minutes to the top and after a whole day of hiking and snorkelling, I decided to give the long hike a pass. We took the shorter option instead — we only need to hike for not more than 10 minutes to a smaller hill on the island. I was so glad that we did this though! Coz we could not see the sunset at all due to clouds covering the whole horizon! I guess today’s activities were one of the most tiring parts of the sailing trip: from hiking in extreme heat to snorkelling! I slept through the night after we finished our dinner. 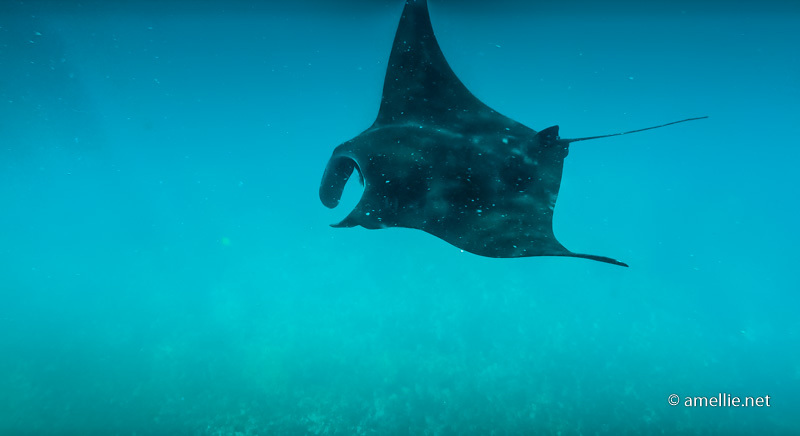 Our first stop for today was Manta Point, where we can see lots of manta rays with our naked eyes. Honestly, I was super scared when I first saw them. Some of them are so HUGE that I felt so vulnerable! But the captain told me that these manta rays are not stingrays. They can’t harm or kill you. 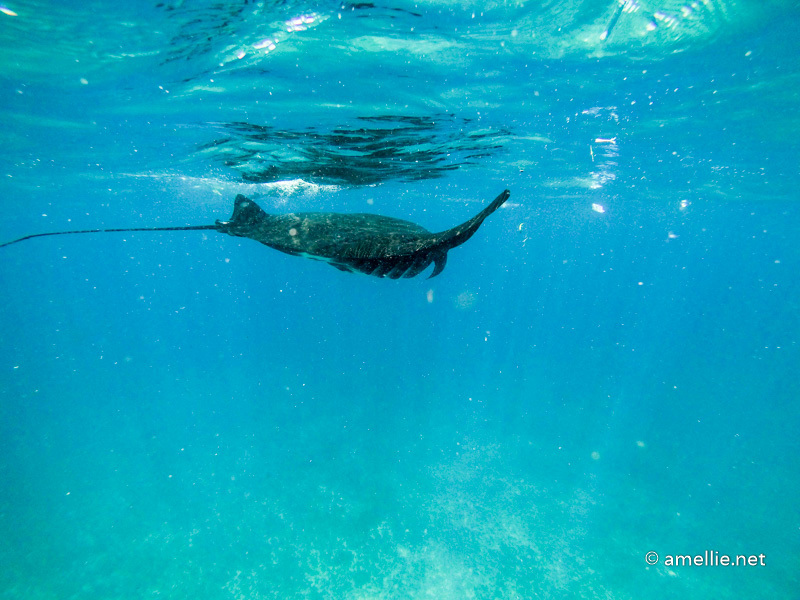 After such realization, I decided to swim again and this time around I was able to see the approaching manta rays. It was an amazing experience to be able to see them close by, with my naked eyes. They are such an elegant creature! Taka Makassar is a popular sandbank near the Manta Point. There were lots of boats and people when we arrived here, otherwise, it is a beautiful place to chillax. Kanawa is the last stop of our sailing trip. 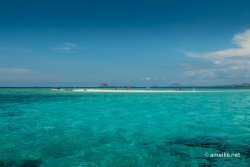 It is one of the closest islands to Labuan Bajo, so it is not as pristine anymore. There is a resort located on this island, but unfortunately, it is badly managed so the cottages did not look well-maintained. It is a shame really, otherwise, it could be a good option for a quick gateway from Labuan Bajo. Our sailing trip ended by 1 PM. After that, we went straight to the airport to catch our flight which departed at 3.15 PM. 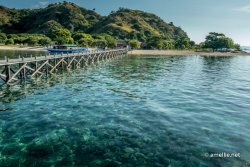 If you are planning to book a flight out of Labuan Bajo on the same day, it is advisable to book the flight with departure time later than 3 PM. Besides having two comfortable reclining seats, the boat also has an upper deck with a big open space where you can chill on a bean bag. It is a nice boat, perfect for 5 people. 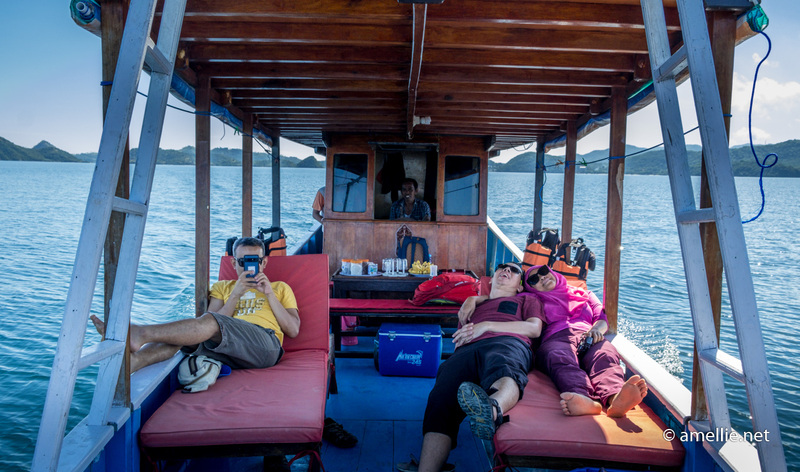 Safety is my main concern and before I decided to take this tour, I did quite an extensive research about the company (Be Borneo Tour, which has a lot of positive reviews on Trip Advisors) and the boat that they use to sail around the islands of Komodo. I have to say that they have a group of experienced crews that know what they’re doing. The captain also has a lot of experiences navigating around Indonesian water — his stories about the big waves near Raja Ampat were very interesting! Our guide, Jo is equally knowledgeable with lots of stories to tell. The meals were surprisingly a lot and delicious! They provide 4 different dishes for each meal. Do let them know in advance if you have some dietary requirements (vegetarian, vegan, etc). Here are our detailed vlogs, courtesy of my husband 🙂 Do subscribe to his YouTube channel! We bought an open trip 3D2N package directly from the owner of the Be Borneo Tour, mas Indra, for Rp. 1,750,000 (~USD 125 / MYR 500) per person (3-bedroom share with fan). For a private double room with fan, it costs Rp. 1,950,000 (~ USD 140 / MYR 550) per person. If you require an AC, an additional Rp. 450,000 (~ USD 33 / MYR 127) per person is required. The prices quoted here are for locals only. For foreigners, an additional Rp. 250,000 (~USD 18 / MYR 71) per person is required for the entrance ticket to the national park. The open trip runs on fixed dates, almost every weekend (check the dates here). 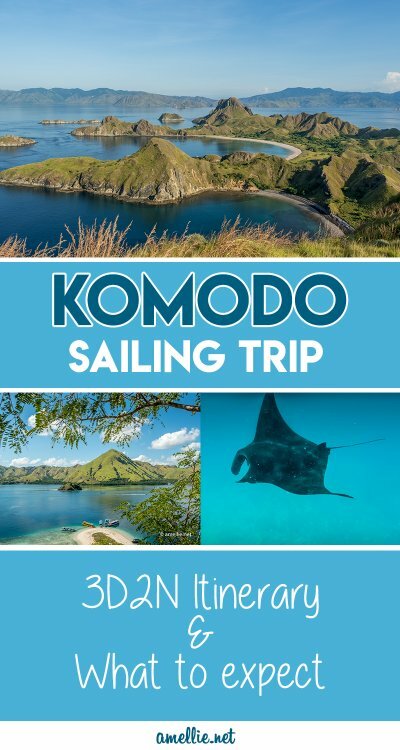 The price includes the entrance fee to the Komodo National Park, meals 3x a day, a guide, running fresh water, snorkelling equipment, a kayak, pick and drop from/to hotel/airport, and even a go-pro that you can borrow. The open trip allows you to share the boat and costs with other travellers. You can opt for a private trip if you would like to go on other dates or if you do not want to mix with other people that you don’t know. Private trips require you to have a minimum of 5 people in order to share the boat costs (otherwise you would need to bear those costs yourself). Mas Indra told me that he has 5-people and 8-people boats. The price is Rp. 1,950,000 per person (bedrooms with fan) for 5 people. The more people you have, the cheaper it can be per person. Love this blog post? Pin it! Click on the image below to pin this blog. 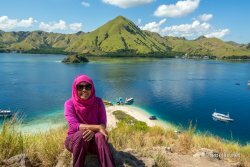 Your picture is truly breathtaking, I am in a search of finding more reference about this sailing trip to Komodo National park and caught on www.islander.io/komodo-sailing-holiday and also stumble across your blog.